A Hussain. Anaesthesia for Spinal Muscular Atrophy. The Internet Journal of Anesthesiology. 2007 Volume 16 Number 2. Spinal Muscular Atrophy (SMA) comprises of a group of neuromuscular disorders due to degeneration of anterior horns cells of spinal cords and brain stem. We report the anaesthetic management of a patient for laparoscopic Nissen Fundoplication due to gastroesophageal reflux disease. We used total intravenous anaesthesia with propofol and fentanyl. No muscle relaxant was used. A 5-years old female patient weighing 14 kg, a known case of Spinal Muscular Atrophy type I with gastroesophageal reflux disease (GERD) was scheduled for elective laparoscopic Nissen Fundoplication and gastrostomy. She was diagnosed as a case of Spinal Muscular Atrophy at the age of 6 month with muscle biopsy. Her two elder sisters died due to the same disease. She had also history of repeated admission to hospital due to recurrent pneumonia. She was receiving pantoprazole 15 mg orally once a day, domperidone 1.2 mg orally four times a day, pulmicort inhaler 500 µg three times a day, injection ceforoxime 470 mg intravenously three times a day and heparin flush intravenously three times a day. On physical examination, she was bed ridden but well oriented in time, space and person. She was unable to hold her neck. She never started walking. Upper limb power was grade 3/5 and lower limbs 1/5. Muscles of upper and lower limbs were flaccid and atrophied. Sensory system was intact. Both knees and hip joints were held in flexion position. There was equinovarus deformity of both feet. Palmar surface of both feet was at 90° facing medially. There was tibial extortion as well. She had khyphoscoliosis of spinal column. Anterior rib cage and sternum were protruding out as shown in the figure 1. Figure 1: Anteroposterior (AP) and lateral view of X-rays whole spine. Note the gross deformity of spine and anterior rib cage and sternum. Anatomy of the air way was clear apart from fasciculations of tongue. Examination of other systems was unremarkable. All investigations were fairly within normal limits. On leaving the patient's holding area to operating room, she brought her hand to anterior chest to shake hand with his father. She was brought to operating room accompanied by her father. Monitors were applied. Preoxygenation with 100% oxygen started and she was intubated with fentanyl 50 µg and propofol 40 mg with cricoid pressure. Anaesthesia was maintained with oxygen, air and propofol infusion 10-15 mg/kg/hour with intermittent boluses of fentanyl. After 90 minutes procedure was converted to open Nissen Fundoplication and gastrostomy. All procedure took 3 hours. A total dose of propofol 500 mg and fentanyl 225 µg was consumed. No muscle relaxant was used. Her trachea was extubated on the table and then transferred to Pediatric ICU uneventfully. SMA type I - Acute infantile or Werdnig-Hoffman disease. Patients present before 6 months of age, with 95% of patients having signs and symptoms by 3 months. They have severe, progressive muscle weakness and flaccid or reduced muscle tone (hypotonia). Bulbar dysfunction includes poor sucking ability, reduced swallowing, and respiratory failure. Patients have no involvement of the extraocular muscles, and facial weakness is often minimal or absent. They have no evidence of cerebral involvement, and infants appear alert. Weakness is greater in proximal than distal muscles and may mimic muscle disease (myopathy). Findings on sensory examination are normal. Deep tendon reflexes are absent, as are long-tract signs and sphincteral abnormalities. Arthrogryposis, or deformities of the limbs and joints at birth, can be observed and results from in utero hypotonia. 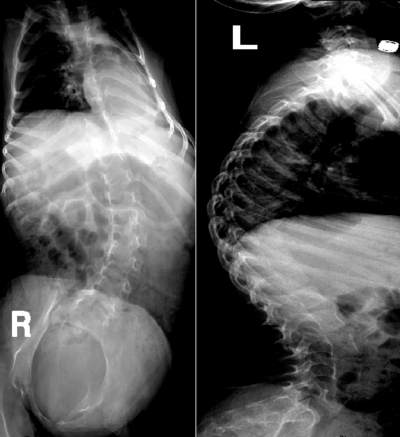 Skeletal deformities (scoliosis) may be present. In the infant or newborn, fasciculations are often restricted to the tongue, but tongue fasciculations can be difficult to distinguish from normal random movements unless atrophy is also present. SMA type II - Chronic infantile form. This is the most common form of SMA, and some experts believe that SMA type II may overlap types I and III. Most children present between the ages of 6 to 18 months. The most common manifestation that parents and physicians note is developmental motor delay. Infants with SMA type II often have difficulties with sitting independently or failure to stand by 1 year of age. An unusual feature of the disease is a postural tremor affecting the fingers. This is thought to be related to fasciculations in the skeletal muscles. Pseudohypertrophy of the gastrocnemius muscle, musculoskeletal deformities, and respiratory failure can occur. The lifespan of patients with SMA type II varies from 2 years to the third decade of life. Respiratory infections account for most deaths. Infants cannot get to a sitting position on their own, though they may stay upright if placed in that position. As with SMA type I, SMA type II cause notable, symmetric proximal weakness, hypotonia, and fasciculations. Findings on sensory examination are normal, and long-tract signs are absent. When the patient's hands are held out, a characteristic fine postural tremor may be observed. SMA type III - Chronic juvenile or Kugelberg-Welander syndrome. This is a mild form of autosomal recessive SMA that appears after the age of 18 months. SMA type III is characterized by slowly progressive proximal weakness. Most children with SMA III can stand and walk but have trouble with motor skills, such as going up and down stairs. Bulbar dysfunction occurs late in the disease. Patients may show evidence of pseudohypertrophy, as in patients with SMA type II. The disease progresses slowly, and the overall course is mild. Many patients have normal life expectancies. Children can ambulate, but they have proximal muscle weakness and various degrees of muscle hypotonia and wasting. The lower extremities are often more severely affected than the upper extremities. SMA type IV - Adult-onset form Onset is typically in the mid-30s. In many ways, the disease mimics the symptoms of type III. Overall, the course of the disease is benign, and patients have a normal life expectancy. Patients are similar to those with SMA type III in presentation and clinical findings, though the overall degree of motor weakness is less severe in type IV than in type III . There are only few reports of anesthetic management of cases with spinal muscular atrophy in the anesthesia literature. These cases were successfully managed with spinal [2, 3], epidural  and general anesthesia with total intravenous anaesthesia (TIVA)  and two cases of general anaesthesia [6, 7] with the use of non-depolarizing muscle relaxant. In the first case it was used due to laryngospasm and patient recovered very well but in the second case delayed return of skeletal muscle power following non-depolarizing neuromuscular blocking agent was observed. Hajime et al  reported a case of difficult airway in a patient with spinal muscular atrophy. A possible hypersensitivity to non-depolarizing neuromuscular blocking agents, and succinylcholine induced kyperkalemia. Presence of weak laryngeal refluxes may predispose the patient to aspirate the oropharyngeal or gastric secretions so patients should be given adequate prophylaxis against aspiration syndromes. Chronic weakness of inspiratory respiratory muscles and decreased ability to cough can result in loss of pulmonary reserves and accumulation of secretions that predisposes to recurrent pneumonia. Post operative pulmonary dysfunction must be anticipated and attempts made to facilitate clearance of secretions. Since there is no or minimal muscular activity, chances of deep vein thrombosis are increased so patients should have adequate prophylaxis. Skeletal muscle atrophy can predispose to long bone fractures so there is need to handle these patients care fully and pressure points padded very well. From our experience gained in this case, we recommend the use of total intravenous anaesthesia (TIVA) without the use of muscle relaxant; general anaesthesia is required in patients suffering from spinal muscular atrophy. 1. Bryan Tsao and Andrey Stojic. Spinal Muscular Atrophy. Available at http://www.emedicine.com/neuro/topic631.htm. Article Last Updated: Nov 2, 2006. (accessed 24 April 2008). 2. Harris S J and Moaz K. Caesarean section conducted under subarachnoid block in two sisters with spinal muscular atrophy. International Journal of Obstetric Anesthesia April 2002; 11(2):125 - 127. 3. Habib A S, Helsley S E, Millar S, Deballi P III and Muir H A. Anaesthesia for cesarean section in a patient with spinal muscular atrophy. Journal of Clinical Anesthesia 2004:16 (3): 217-219. 4. Veen A, Molenbuur B, Richardson F.J. Epidural anesthesia in a child with possible spinal muscular atrophy. Paediatric Anesthesia July 2002; 12 (6): 556-558. 5. Watts J C. Total intravenous anesthesia without muscle relaxant for eye surgery in a patient with Kugelberg-Welander Syndrome. Anaesthesia January 2003; 58(1):96. 8. Arima H, Sobue K, Tanaka S, Morishima T, Ando H, Katsuya H. Difficult airway in a child with spinal muscular atrophy type I. Pediatric Anesthesia May 2003;13 (4): 342-344.